Spacious appartment with a fantistic view to the City Park Városliget, can accomodate up to 4 people. The rooms have access to the kitchen, provided with cooking equipment and supplies, and it's spacious. This is also an ideal place to relax, in fact this innovative private apartment, gives you the privacy of your own space but also acces to all other services. Situated in the most popular 7th district, offering a view to the City Park, near Heros’ Square. There is also a vibrant and ever expanding bar and restaurant scene in the same district. Transport to and from anywhere is easy: several bus lines and metro lines (1, 2, 4) are available in walking distance. Road: By car – If it’s requested I can give you a detailed routing. Situated in the most popular 7th district, offering a view to the City Park, near Heros’ Square. 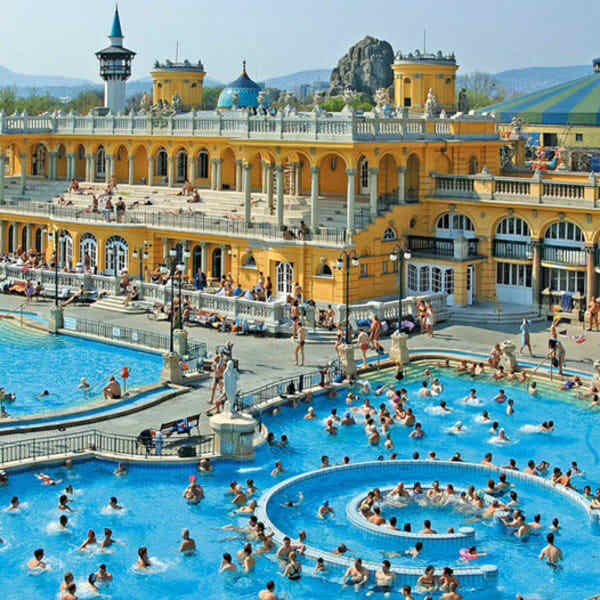 The famous Széchenyi Bath, museums are in walking distance. In the next block of flats there's the famous Paprika Restaurant offering hungarian dishes. There is also a vibrant and ever expanding bar and restaurant scene in the same district. Transport to and from anywhere is easy: several bus lines and metro lines (1, 2, 4) are available in walking distance. You can easily reach the gay clubs and the center from the apartment, you just have to go to a public transport car (tram 74). You can contact Johnny through the Contact Host button on this page. If you've already booked, go to My travels. Interested in more accommodations around Budapest?